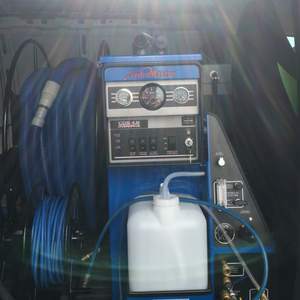 The ultimate best tile and grout cleaning machinery designed for residential or commercial is known as a truck-mount. Truck-mounts are large custom machinery usually carried in a van or truck designed for indoor/outdoor use and typically use the van’s power to drive vacuum, high pressure, and heat. Between these 3 main functions, tile and grout can recover from it’s dirtiest level, to back to like new! 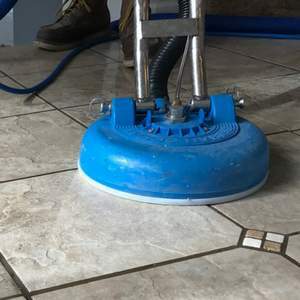 FAST!This tile and grout cleaning machine is the most effective and efficient operation designed to clean all tile and grout including ceramic, porcelain, travertine, marble, and more. Floors, Counters, and shower stalls. A typical 1000 square foot area can be cleaned within 1 hour with little to no bending, with the right attachment. The attachment is referred to as a tile and grout cleaning tool which is tied into the truck-mount utilizing its heat and suction. This tool hovers over your tile and grout and spins at a 1000 rpm with hot steam and suction on the outer rim. There are other tile cleaning tools, but the spinner is by far the most effective tool. 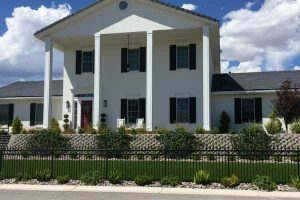 Buying a New Home with Tile and Grout? What is Dirty Grout? What can you do about it?